Craig Elliott has been left demanding more from his strikeforce as Boston United were beaten at Leamington last night. 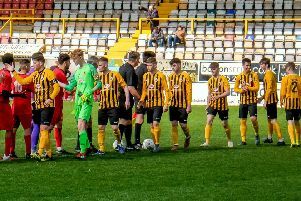 Matt Stenson and Junior English scored the vital goals in the 2-0 result, while the hosts had Callum Gittings sent off just after the hour mark. “We started well but in the end we got non-leagued, if that’s a word. Boston created chances but failed to really test home keeper Tony Breeden, leaving Elliott wanting more from his attackers. “I thought we looked weak in attacking areas, we got brushed off the ball a lot.,” he added. “Their desire levels, unfortunately, were a lot greater than ours. Commenting further on his attack line, Elliott added: “They’ve got to be accountable. We need more. “On paper we’ve got some good players but I think they need to show more, if I’m being honest about it. Despite his frustrations, Elliott refuses to be disheartened and wants a reaction at FC United on Saturday (KO 3pm). “Nobody likes losing but the reality of the league is it’s going to be very up and down,” he said.